Michael Dunlop achieved an impressive best finish of second place in his competitive sidecar debut at the Scarborough Gold Cup races. Dunlop, with Manxman Dan Sayle in the chair, took sixth and seventh positions in his other sidecar outings. The Ballymoney rider was fourth in the main Gold Cup race, which was won by Guy Martin. Ballyclare's Jamie Hamilton was fifth. Dunlop also took a fourth place in the 1000cc Trophy first leg on Saturday. William Dunlop secured one win in the 250cc class, while Michael Pearson was second and William third in the second leg of the 600cc class. 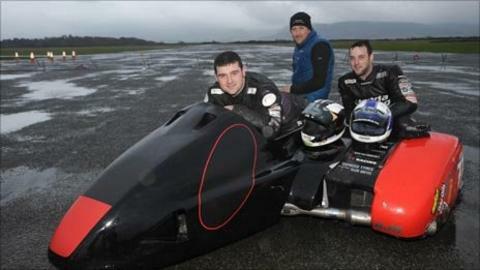 Michael tested a sidecar for the first time at the Jurby circuit on the Isle of Man last year and had considered racing on three wheels at this year's IOM TT. He has enjoyed a successful season, which included a TT win, a Southern 100 solo championship success and two Ulster Grand Prix victories.